I was born and raised in Kitchener, Ontario, the home of central Canada’s Mennonite and Amish country, it’s claim to fame long before the Kitchener-Waterloo area became famous for Research in Motion and the Blackberry. Growing up in K-W a half century ago meant Saturday visits to the market and the Mennonite stalls there — free slivers of cheeses (Colby was my favorite), cherries, peaches, plums and pears in the summer (I was tasked with taking the baskets back to the car while Mom completed the shopping) and chunks of homemade summer sausage fresh from the “sock” that I remember to this day. And a welcome supper of pig-tails (I kid you not) in spicy tomato sauce. We won’t even mention the sweet pastries that completed the meal (don’t say “strudel”, whatever you do!). 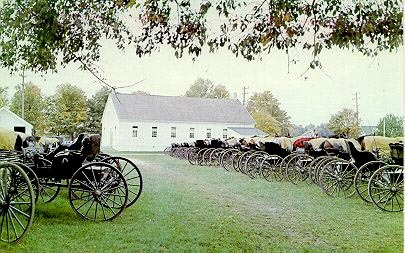 The Mennonites in the area of my childhood rejected all technological devices — no cars, phones, tractors or machines of any kind. As for radio and television, forget it — even “dance” was forbidden. In the 50 years since, parts of the faith have split off and accepted at least parts of the modern world. I have a number of Mennonite friends whom I would classify as “closet lefties” — they are quite happy accepting technology, but remain true to the history of their faith in a commitment to helping the developing world and a devotion to pacifism that I happen to share. All of that is a way of backing into a discussion of a “Mennonite” book. Canada has more than one author with a Mennonite background — Darcie Friesen Hossack, with this debut story collection, joins Miriam Toews and David Bergen in the ranks of Canadians writers who grew up Mennonite. Like both Toews and Bergen, she comes from the harsher, repressive side of the faith (particularly as it relates to daughters, I must say) and that shows in this collection. Friesen Hossack’s Mennonites are in transition — especially the younger, female generation — and they are not really comfortable with it. Their parents, needless to say, have an even bigger problem. That theme, along with another that is every bit as prominent — mothers and maturing daughters — makes this collection an intriguing study of the pressures of change that are present in modern North American society (if you will, it is similar to that portrayed in Jhumpa Lahiri’s short stories, only these ones have a few more generations of North American history behind them). If she’d had her way, Lizbeth would’ve hitched a ride into town that morning with her father and two of her brothers. Even though all they planned to do there was buy two more cartons of grapefruit and maybe argue down the price of a reconditioned tractor. Lizbeth would’ve given her left braid to get near a little civilization, even if it was only Swift Current. From the tractor yard she could watch people as they walked along the sidewalk. Imagine they were going to the mall or a matinee. More than anything, Lizbeth wanted to go to a matinee. She was a bother in the kitchen, anyway. But because hundreds of years of Mennonite tradition weren’t about to give her a day off to indulge in some civilization, she swaddled herself in an apron first thing every morning, just like her mother and sisters. Sisters who, unlike Lizbeth, never thought of running to the edge of their village to see whether they’d fall off a precipice. Straight into the real world. The defining event in Lizbeth’s life happens only days later when her favorite brother, John, is murdered by the neighbor’s sons in a semi-religious outrage. Lizbeth cannot accept the way her parents forgive the parents of the killer — it begins the process that, as the story unfolds, leads to her marriage to a non-Mennonite and the tensions (and humanity) that that exposes. “Uh-uh,” Lizbeth said, mentally kicking herself for having nothing clever to say. “Um. It’s okay.” Lizbeth pushed her toes through the dirt. Secretly, she was already planning to re-live the moment in her imagination, turning it over and over and savouring it like a lozenge. That theme of a young woman trying to escape a repressive home is present in a number of the stories in this collection and it does not always hinge on the Mennonite connection. In the book’s final story, “Poor Nella Pea” returns home to the house of her dead mother, six months after the death. In January, rather than sort and box all the memories that exist as shelves of chipped curios, antique linens and decades of clothes, I simply locked up and left. The only think I took was my mother’s childhood diary, my other inheritance. It’s (sic) paperboard cover is swollen and tatted now, from being read while I washed dishes, and being dropped in the rain. After a walk-through of the main floor, trying to appraise it as a buyer might, I take the staircase to the second storey. The banister is so thickly waxed it feels like a candle, and when I touch it, dust sifts down around the spindles like silt settling in a pond after it’s been churned up. It’s going to take a lot of work to scrape away all the evidence of the lives lived here. Much more though, my realtor says, if I want to sell the house rather than pay someone to push it over. Penelope, the narrator, is moved to contemplate her own history with her mother — it comes down to an experience with a cat and her kittens, but it has marked “Poor Nella Pea’s” life ever since. Those of us who are old enough all have versions of these childhood memories — Friesen Hossack does a very good job of capturing some of them. While I liked those generational stories and the description of tensions between mothers and daughters, I will admit to a preference for the ones that explore some of the tensions of being a young Mennonite — perhaps because it brings back such strong reminders of my own childhood, my parents involvement in faith and my own rejection of it. Throughout my part of North America, there are sects like the Mennonites, or Amish, or Hutterites, or Doukhobors, or even Mormons, who live outside the “norm” as I know it. Any author who undertakes to make that more understandable is performing a valuable service for us non-believers I would have to say.